Travel with Kevin and Ruth! : We are now carless, for the first time ever! When I met Ruth in 1983, I was driving a 1971 Buick Skylark 2 dr hardtop. That was a beautiful car. I had bought it from a little old lady. It was a plain jane car, with zero options. Not even a radio. Or a carpet! Just a rubber floor mat. I fixed it up nice. I installed carpet and a radio, but I also put on a 4 barrel intake and carburetor, and dual exhaust to beef up the Buick 350 engine. Working in the bodyshop business, I had it painted for a good price. And I came across some nice Buick factory rims and put on some good rubber. It was a pretty nice car by the time I finished with it. We drove it to Florida for our honeymoon in 1984! I can't remember why we sold it, or for how much. Obviously in hindsight, we should have kept it another 30 years! While we owned the Buick, we bought another car. 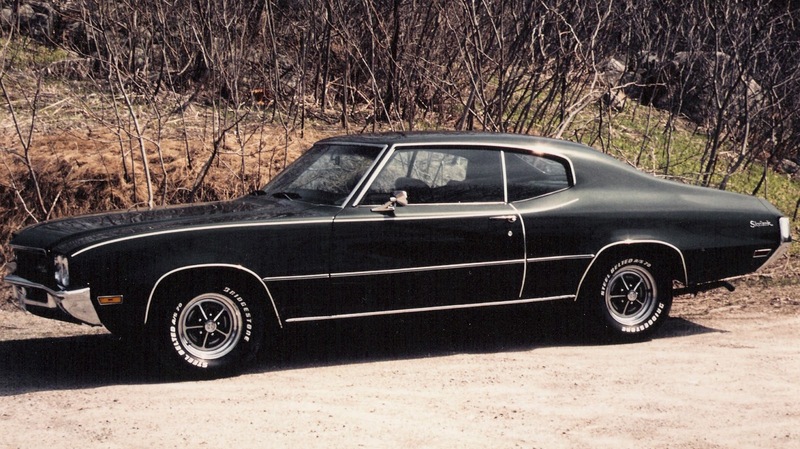 Because the Buick was now a nice car, I didn't want to drive it in the winter. So we bought a Chevette. Didn't everyone own a Chevette at some point in their lives? I can't remember what year it was, 1978 maybe? I do remember that we paid $1,800 for it, drove it for a full year without putting any money into whatsoever, and then sold it for $1,800 exactly one year later. In 1986, we bought a 1982 Cutlass Supreme 2 dr hardtop. Paid $7,500 in cash for it at the time. I remember the look on that lady's face when we started counting out the bills. This one was fully loaded with all the toys except for a sunroof. It was a nice car! But while this was a nice car, it wasn't very practical for us. Ruth was pregnant with our first child in 1986, and when the baby was born that car was not very easy for getting in and out of the back with a car seat. We put up with is for another year or so before deciding to get something with four doors. 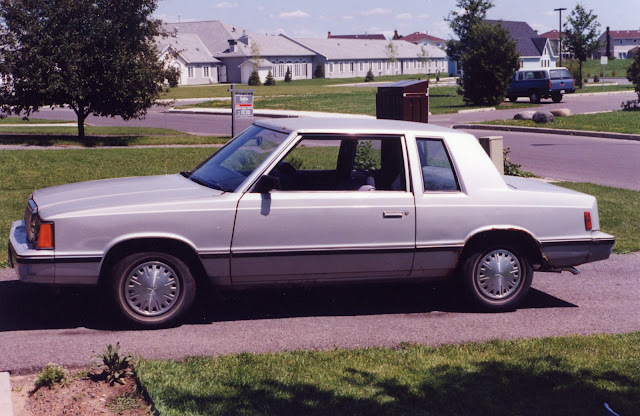 We sold the Cutlass (can't remember for how much) and leased a new 1987 Chevrolet Celebrity four door. Not one of our better moves. The car itself was only just okay, and of course leasing has some benefits and some drawbacks. I guess at the time it seemed to make sense, but in hindsight it wasn't a good move. One of the problems with leasing is that you're kind of stuck with the car for the term of the three year lease. Sure, you can get out of it... at a cost! 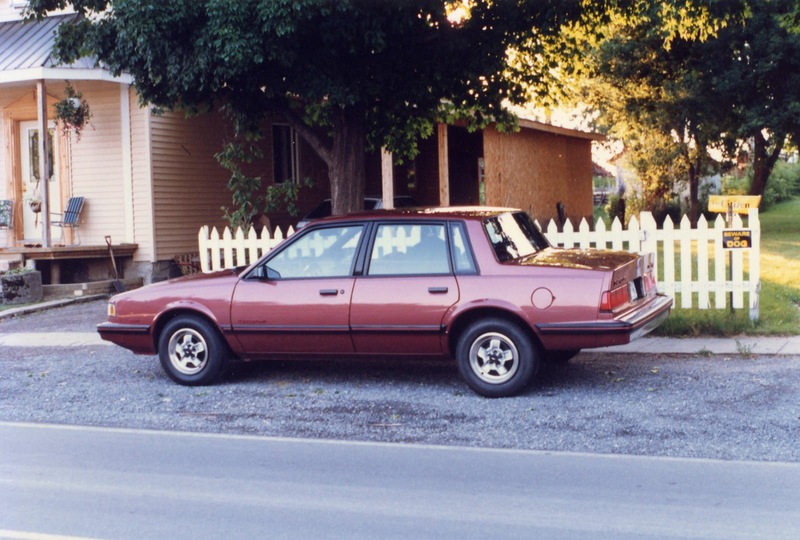 This kind of became Ruth's car because I had a pickup truck to use through my bodyshop. Then, because we still hadn't learned our lesson, we signed up for another three year lease! 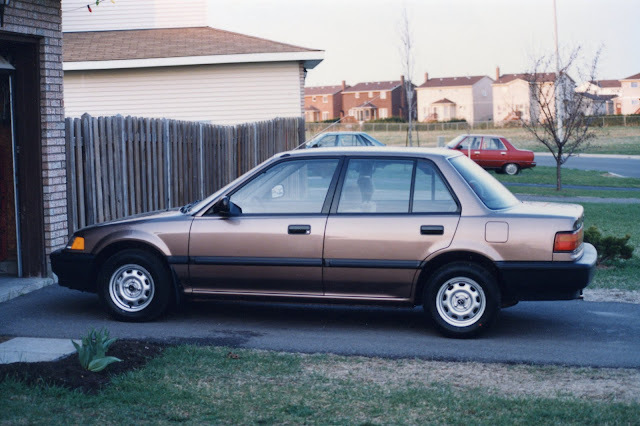 At least this time we chose a decent car... a 1990 Honda Civic 4 door. It was a good car. 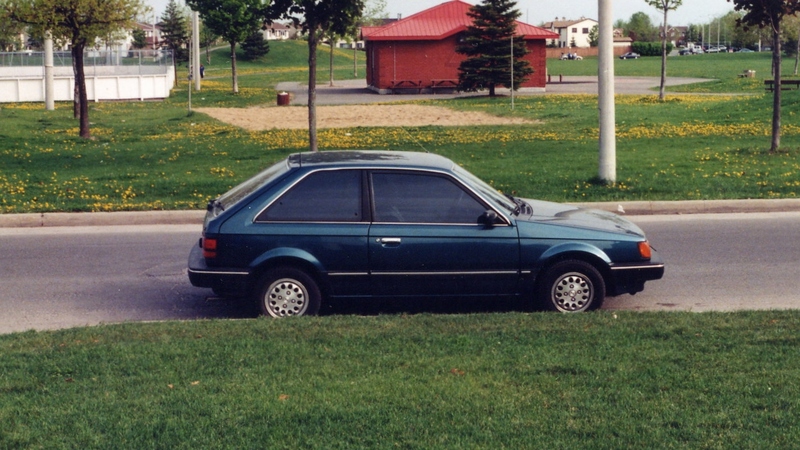 1990 Honda Civic 4 dr. Through much of the 1990's, I had a variety of vehicles, some of which I didn't keep very long. Being in the car business, there was always some kind of deal to be made. I had an old Plymouth Reliant K car for a few months. It was junk, but it served its purpose at the time. Sometime around 1995, I decided I needed a toy. I came across a 1983 Mazda RX-7 sports car that had low miles and was in good shape. It was in good shape, but I didn't like the gold color. 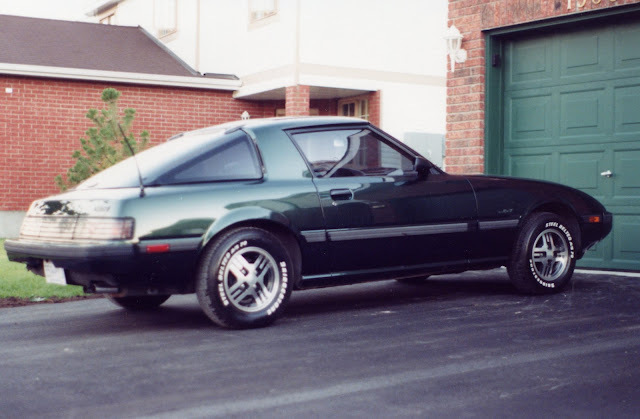 I owned my own paint shop at the time so I totally dismantled it and changed the color to a nice metallic green. Not the best picture, but it's all I've got! That car was a real head turner. This is when they were first coming out with clearcoat paint, and I put two heavy wet coats of clear on... it looked like a sheet of glass. Meanwhile, I didn't want to drive that car in the winter either. And the lease had expired on the Honda, so we simply gave it back. By now, we had learned our lesson. No more leasing for us! We bought an old Buick Skylark (quite different from the first one) from Ruth's brother. We took it tent camping at Whiteface Mountain in New York state. 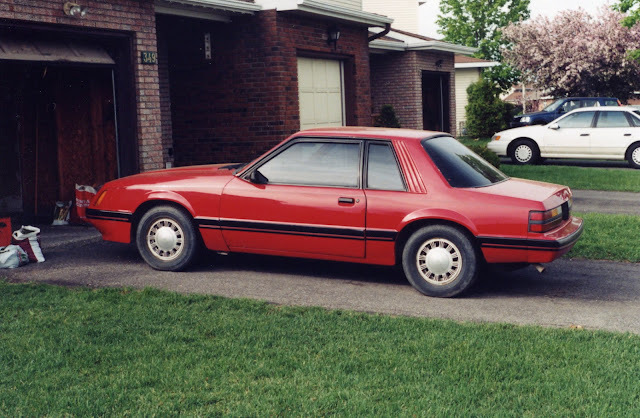 In 1998 I had a 1985 Mustang that was pretty much given to me. I think I paid $200 for it. But it was really rusty. I did a quicky plug and fill paint job on it. We had a saying in the body shop business. "Good from far, but far from good!". It looked nice and shiny, but there was lots of rust under that shiny paint! Meanwhile, somewhere along the way I had picked up a 1986 Mazda 323 that was actually in nice shape. It was silver in color when I bought it, and I painted it a nice teal blue for Ruth. This was her little car for a couple of years. I got the windows tinted, and it looked really sharp! The last vehicle I did up for myself before I got out of the bodyshop business was a 1974 Chevy 1/2 ton. Again, It was a junker when I bought it and I paid $600 for it. I installed almost all new body panels and ended up putting a new engine in it too. I drove it for about two years and then sold it for $6,000. That sounds like a big profit, but I also had a lot of hours into it as well as new parts. 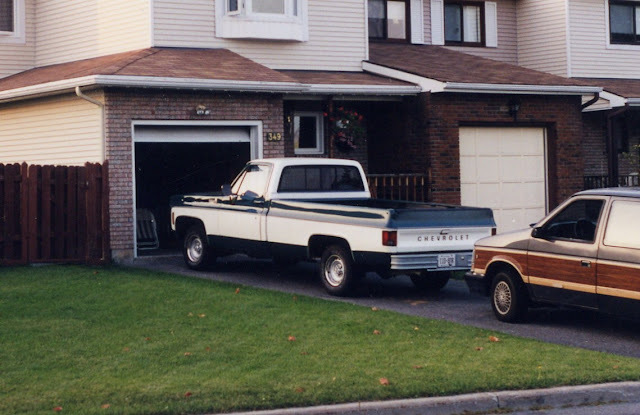 This is the only picture I have of the 1974 Chevy 1/2 ton! By the year 2000, our kids were now in their teens and we needed a minivan! So I bought an older Plymouth Voyageur minivan for a couple of years. It was a good van until the transmission went out! It was one of those ones with the fake woodgrain paneling on the side. 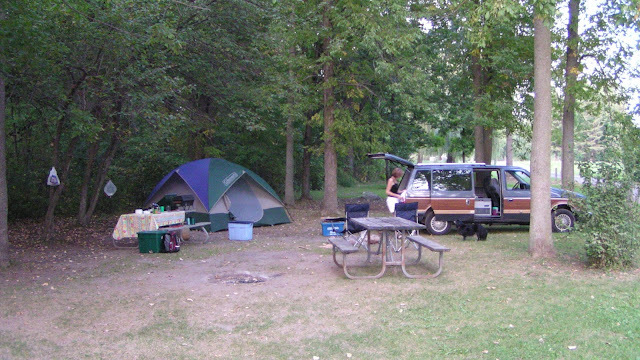 Tent camping with our minivan. Hey, there's Ruth and Whiskey! In the early 2000's I was doing a lot of contract work for some of the major car rental companies in Ottawa, and I often got good (and sometimes even free) deals on rental cars. When I needed something nice for the weekend, I often just had to ask! Nice ride... but not ours! Just a rental. Sometime in 2003, I was offered a deal from one of the car rental companies. 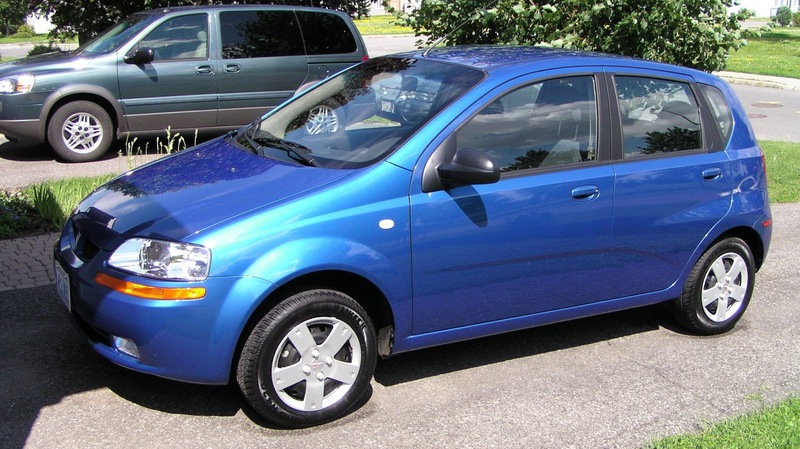 It was a 2002 Kia Rio... pretty much brand new, but it had a blown engine. One of their employees had done an oil change on it... drained the oil, changed the filter, put the drain plug back in... and forgot to put any new oil in it! Dummy. They rented it out like that and it made it about five miles before it blew up. I bought it for peanuts and put a used motor in it. Our daughter Lindsey (right) with her friend and our 2002 Kia Rio. We had that 2002 Kia until 2006 when we sold it to our daughter. At the same time, I had bought an old Honda Accord from a friend of mine's girlfriend. It was an old junker but it had really low miles. I was using it for my job at GMAC financing where I was working as a lease return inspector. Mechanically, it was a great car (you can't kill a Honda engine!) but it had been bitten by the Ontario rust bug. Tent camping with the old Honda Accord. Hey, there's Ruth and Whiskey again! Because I was working for them, GMAC offered us a deal on a new car. $500 over dealer invoice, with 0% financing over four years. 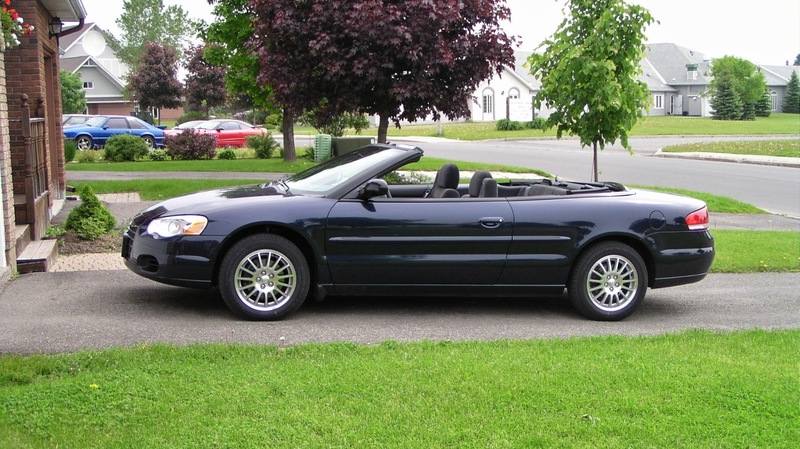 Plus, they gave us $1,000 for the old Honda Accord that I think I had only paid $500 for. I ordered the little blue car especially for the fuel economy. So I wanted a manual transmission and no air conditioning. But, I wanted cruise control. The cruise only came with an options package that included power windows and remote power locks. So that's what I got. It was a bit of an odd combination with the manual transmission and no air. But at the time, it's what made the most sense. So, it feels a little strange to not own a car. And we don't see one in our future. As I said, we'll rent when necessary, and otherwise borrow or taxi. We would never taxi in Canada or the U.S., but in countries where taxis are reasonably priced, that's what we'll do when we need to. Wow... I had fun doing this post. What's the best car you've ever owned?? Sometimes, you don't want air conditioning... these awesome little fans are great for those times, and they're dirt cheap right now! Thanks Connie and Barry and yes, we have used UBER before and that is always a possibility. Undoubtedly, Euri of course, our 1993 VW Eurovan. You know the history of that one it took us on over 130,000 kms of adventures through Mexico and USA. The other "best of" contender would be our 1979 VW Westie. Thanks for the trip down memory lane as we actually owned a number of those same cars. Still, there is always that one car that you wonder "...why did I sell that??" No doubt Euri was your favourite! He had taken you on some fabulous adventures, I am sure it was a very sad day when you said goodbye to him. I think my 1984 Pontiac Fiero that I owned in 1988 was my favorite. It was white and fun to drive. Every time I went to Mr Lube for an oil change they asked me to pop the hood! LOL (only mechanics understand this joke). My current vehicle is the Jeep patriot (2017) and this year is the first time I have owned a new car in my whole 50 year life. My previous vehicle was my second favorite, 2000 Ford Explorer Sport. I loved that truck. Had it 13 years. It had 2 doors and cool little windows in the back for air that a kid can't get his head through :). I had the back and side windows tinted very dark and it made the truck look so cool. It's fun to see all the vehicles we have had over the years! I remember those Fiero's! Spiffy little cars they were. That Jeep of yours will get you to some fun places, I think I would like it better than the Fiero, definitely much more practical. Karyn, Those Pontiac Fieros are sought by car collectors around here (South Carolina). After they are restored to their original state, they are ready for the car shows in Florida and Vegas. You do Uber? It is really reasonable. We do it all the time in Houston. We have done once or twice but really when we are in a city we almost always walk, bike or use public transportation unless it is at some weird hour in the night, that's when we used UBER before. "drained the oil, changed the filter, put the drain plug back in... and forgot to put any new oil in it!" I did it the other way around once - drained the oil, changed the filter, put the oil in, forgot the drain plug. Big mess. We are also car-free and have been since we sold our Honda CR-V (great car!) in 2015 to move to Mexico for awhile. 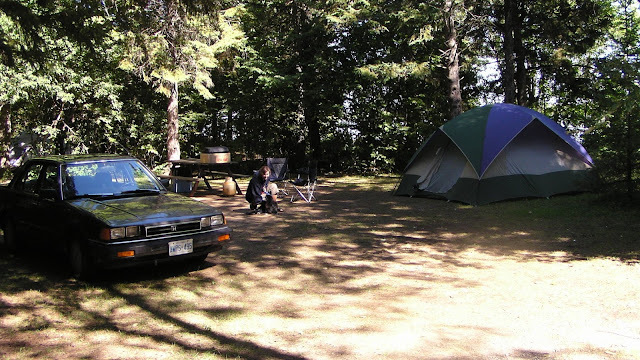 When we ended up coming back to the US, we bought our RV, and that is our only "car". We do have six bicycles between the two of us, though. We've rented cars occasionally when needed, borrowed from relatives when possible, and usually figured out alternatives: buses, walking, and biking. Being car-free has saved us a lot of money, and while it's caused headaches at times, it has saved some headaches as well (insurance, registration, gas costs, having to tow behind our motorhome, etc.) We fully embrace being car-free! Yep, that's about the way we feel! Much more freeing without the worries and expense of owning a car. And yes, sometimes it is a little inconvenient but we almost always find a way. Gotta love all the old cars we have had. Me over 35 of them and 2 motorcycles. But my favourite was the 1956 Plymouth Fury I bought, for $125.00. 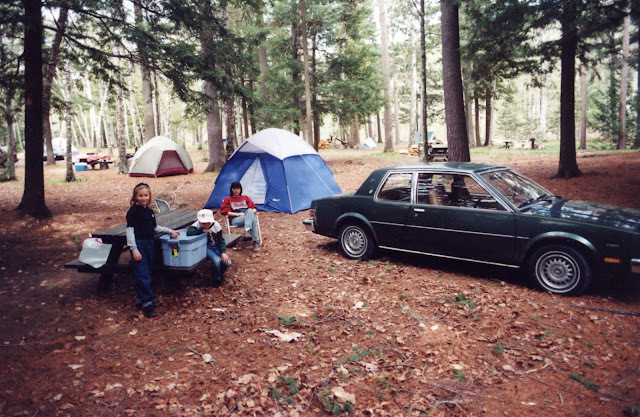 Was 9 years old had just came from California, No rust, custom interior , electric trunk, tinted glad not a spot of rust. But the oil had never been changed. Boy did it smoke, ! picked up a rebuilt Hemi from a 1958 despot, dropped in the with a few modification. and WOW did this thing fly. Lots of street racing in Scarborough, I loved that car, but did sell it for a couple of reason, 4 miles per gallon fuel economy, and I drove a lot of miles, and I would not have loved much longer if I kept it. But boy was it a fun project. Sounds like that would have been a beauty of a car, we can see why it would have been one of your favourites! Our family of six drove from Perth, Ontario to Coco Beach Florida (to do Disney) in a K-car. I don't know how my parents survived that one!